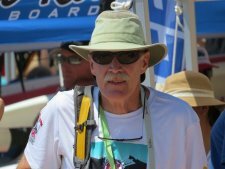 Larry Fisher, "old man winter," was the founder of Ski and Bow Rack in 1985 and proudly ran it for 33 years. He had a mustache that was the envy of the town, knew more about custom insoles than most people knew about themselves, had sold half the town (easily) his custom insoles, would vacuum your feet during the winter (to fit you into the Fischer Vacuum-Fit Ski Boots), and made the best homemade chocolate ice cream this side of Saturn. He was a beloved boss who's predictable answer to any salutation ("I'm doing just pretty good") will be sorely missed. Bruno and Jolyn's passion and joy is found in seeking out and soaking in the grand expanse of our good Lord's creation. 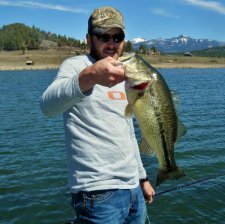 They enjoy the beauty of Pagosa country while skiing, snowshoeing, backpacking, hiking, and fishing with their two dogs, and if per chance you meet them on the trail, well, let's just say you'll know them when you see them. Note the picture. Jolyn is a tall, beautiful blonde, and Bruno is...well...much bigger. How tall is he, you ask? 5' 24" But don't be intimidated; his smile is genuine, and he and Jolyn will make you feel like you're old friends in minutes flat. Paul has been a backbone in the ski shop here at Ski and Bow Rack for years. Despite the almost-perpetual scowl, he's actually pretty cool, and he can tune a ski like a harp. He knows Pagosa country well (back of hand sort of well), and will happily lend his knowledge to those who ask, or to those who don't, but obviously need it. Moral of the story: ask. 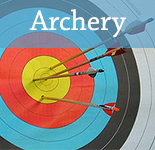 Sally is the most knowledgeable archery tech in the Four Corners, if not the Milky Way Galaxy. She will gladly help anyone learn more about bows and how to shoot them. She's an institution here in Pagosa and well deserves her fame. 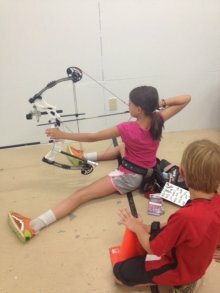 Her archery accomplishments are the stuff of legend. And as rumor has it, she's never going to die because A: she recently survived a nasty horse fall that broke seven of her ribs and B: we can never hope to replace her here. But for now, you can come in to the shop, drink in her wisdom, and bask in her glory. 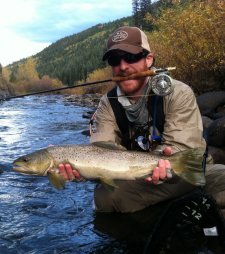 Chase tells everyone that he moved to Colorado in 2009 for graduate school, but we all know his real motivation for relocating to the Rockies: feeding his addiction to fly fishing. 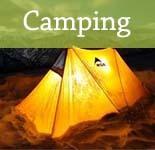 In addition to guiding trips for us, Chase is also one of our backpacking experts. His love for backpacking led him to complete a thru-hike of the 2,181-mile Appalachian Trail in 2011, making him a strong candidate for the craziest shop employee. That trip has led him to embrace minimalism in both hiking and fishing, because, let's face it, we'd all get sick and tired of carrying any extra weight for 2,181 miles. His favorite days off work are those spent chasing wild trout deep in the Weminuche Wilderness, often using traditional Japanese tenkara equipment and techniques. But if he sounds too crazy, just try talking to him. His easygoing manner and winsome attitude will convince you otherwise. 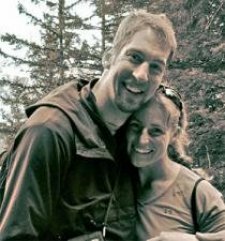 There's only so much you can say about a guy who loves Jesus, loves his wife Heather, son Edmund, daughter Berea, the little baby Janner, and after that fishing, skiing, hiking, writing, soccer, and most everything outdoors. Also, jokes. By the way, did you hear about the guy who threw his alarm clock out the window? He wanted to see time fly. Really, you can tell that he grew up here and never got away--in the best way possible. Also, what do you get when you cross a sheep and a bumble-bee? A bah-humbug. If you want more jokes, you have only to ask. Sandrine is our French Sally. She loves archery and grew up shooting in France. Yes, she's from France. We know that. We hired her anyway. Though if you ask her where her accent is from, you could very well get "Montana" or "Texas" as an answer. And while she's an archery genius, she plays ski technician, shop display wizard, and fashion guru on the side. She's generally cold and therin knows a great deal about the secrets of staying warm in the wintertime. And if you learn nothing else about her, learn this: purple is her favorite color. Our shop mascot. No, seriously. He looks like our viking, minus the horn-studded helmet. The good news? 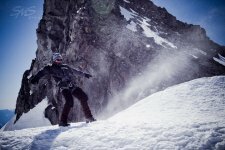 He's the friendliest ski tech you'll ever meet. Honestly. He's missing the bash-your-face-in demeanor most vikings possess. Instead, there's always this silly smile plastered on his face, and we're not quite sure if he ever grew up or just finds the best (ie funniest) in any situation. 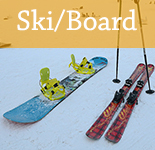 But fortunately, he's also a good ski tech. The guy loves to ski in the winter and boat in the summer. He's a heck of a raft guide, but isn't too shabby on a canoe, either. In fact, I wouldn't put it past him to try canoeing the ditch in the road after a rainstorm. But when you come in to get rentals, look for Morgan and then enjoy your stay. If the first thought you have about Garret is, "Now, THAT guy probably wrestles bears while simultaneously cutting rounds with a chainsaw and fixing a compound bow," you're not too far off. I would probably add something about catching a state-record bass out of like a pothole on a forest service road or something like that. If anyone could do it, Garrett could. But truthfully, Garrett knows hunting and fishing like a librarian knows categorization systems. Okay, poor simile, but you get the picture. However, don't let the tough guy exterior fool you. He's a proud daddy to a beautiful little girl, and yahyoubetcha, he's got a soft spot. For her, anyway. But if you need to talk hunting or bass fishing, he can tell you all you need to know, plus some. Well, minus his favorite spots. There are rules about that, you know. First off: don't ask for his full name. It takes about five and a half minutes when rattled off at Mach 2.5 in Spanish. Secondly, this Puerto Rican guy will talk your ear off if it has to with fishing. I'm fairly certain that no less than 15 girlfriends have left him the dust because of his obsession with catching fish on a fly rod, and he himself admits it may be an incurable sickness. His favorite water to fish is salt in his homeland, but he'll help you out in any water with a flashy, infectious smile. Hence the girlfriends to start with. He's fished the San River in Poland for trout, Guatemala for Bones, Florida for Reds, Puerto Rico for Tarpon, and the list goes on. And on. And...well, you get the picture. Some people call it bragging. 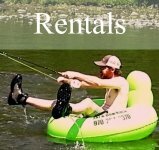 We call it a well-oiled resume for a top notch fly-fishing guide. Come in say hello (in English or Spanish), and I'm sure he'll ask you if you want to go out and fish! He's the closest thing we have in this shop to a Renaissance man. 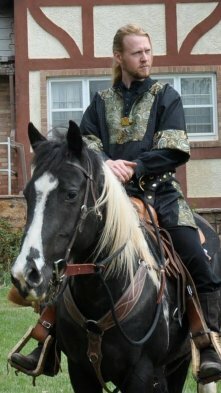 From ski tech/bootfitter, to door repairman, to computer tech, to medeival armored combat/horse jousting devotee, to master veterinary specialist/ectothermic enthusiast, to frenzied writer, to operatic singer, Shannon does it all, and does it well. Usually with a smile. Unless he's working on the front door...again. Then, perhaps not so much. But an especially large grin crosses his face when he talks about greatsword tactics. Oh! And ask him about crocodiles. I dare you, and then prepare to have your mind blown! He's madly in love with with his beloved wife, Estella, who is an artisan leatherworker of epic proportions, and they own and train three marvelous horses, one rascal pup named "Finn," a Ball Python, two Bearded Dragons, and a cat by the name of "Cladaugh" who rather wishes she was the only pet in the house. Why Shannon works here, we may never know, but we're sure glad he does! Yes, his name sounds exactly like it's spelled. He's a boarder. Yes, I know for some of you images of bloodthirsty vampires waiting to ambush you from the trees flood your mind. Others of you have the phrase "Right on, bra!" popping into your head. But Niall is a boarder of the highest caliber and is a VERY HELPFUL snowboard tech. He knows his stuff and will get you riding with the best of them. Also, he happens to be a tech wizard and often rescues us from computing woes. Thank God for Niall Pastuszek, however you say his name. Bryan Smith. 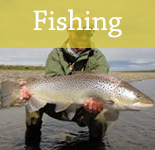 Soon this name will be synonymous with "awesome fishing" to most everyone in Southwest Colorado who has taken a guided fly-fishing trip or known someone who has. 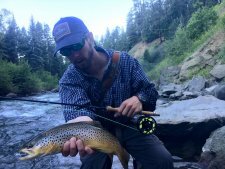 His cool collected demeanor and genuine smile will melt anyone's trepidation and his knowledge, and his guiding ability will impress even the most snobbish fly-fisherman on the planet. And if you happen to be a Pittsburgh Penguins fan, you'll like him even more!